Examples of branding, marketing, and function in a business networking group website. 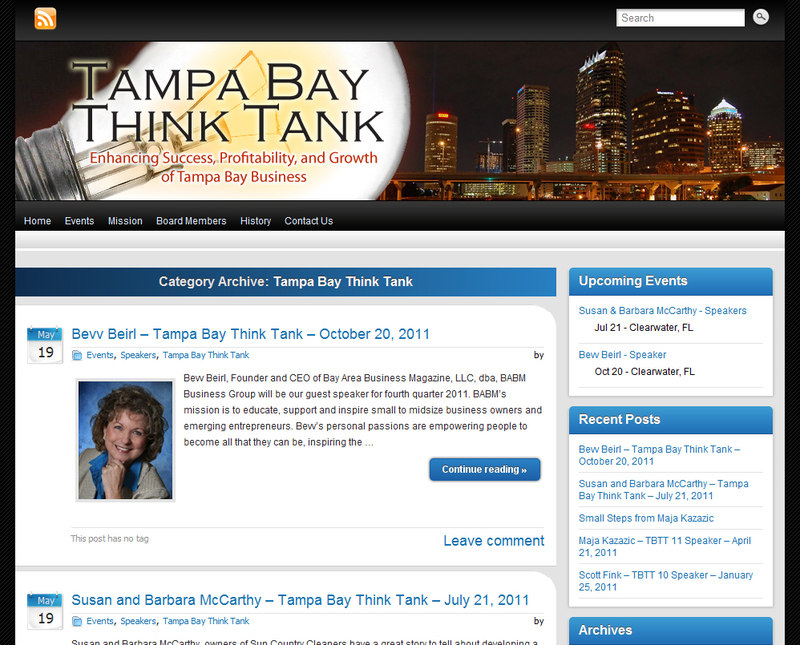 As a member of the Tampa Bay Think Tank, I volunteered to re-design their website and to provide consultation and ongoing management for it's design and function. Their Mission: "Created to enhance success, profitability, and growth of Tampa Bay Businesses through the communication of enduring and innovative business practices and by creating a forum for the exchange of ideas and initiatives among business owners, executives and professionals." The prior website was designed without a content management system, so required expertise in html and ability to ftp from a workstation. It had one component at Wordpress.com - the blog. A third feature of the website allowed guests to register for upcoming events through a third party website. My re-design had several goals: 1) Produce a professional website, up to the standards of such a fine business group, 2) Combine the functions of the necessary site components into one package, 3) Develop the site completely in a self-hosted Wordpress system, so that in the future - anyone with minor training could continue to manage or develop this site. All goals were achieved, and the Board of Directors and members are very happy. 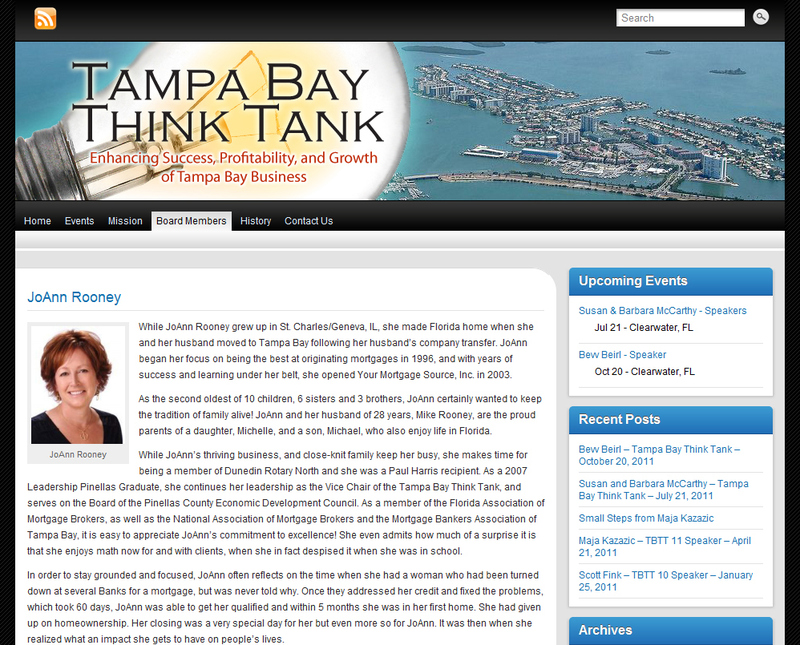 This screenshot shows the new identifying mark that I developed for Tampa Bay Think Tank, which is modern, yet pays homage to the original design. The website has three headers which randomize themselves. Each represents a part of Tampa Bay - Tampa, St. Petersburg, and Clearwater Beach. The home page includes excerpts from the three most current blogs. In general two will be upcoming events, and one will be a re-cap on the last event, with photo(s). 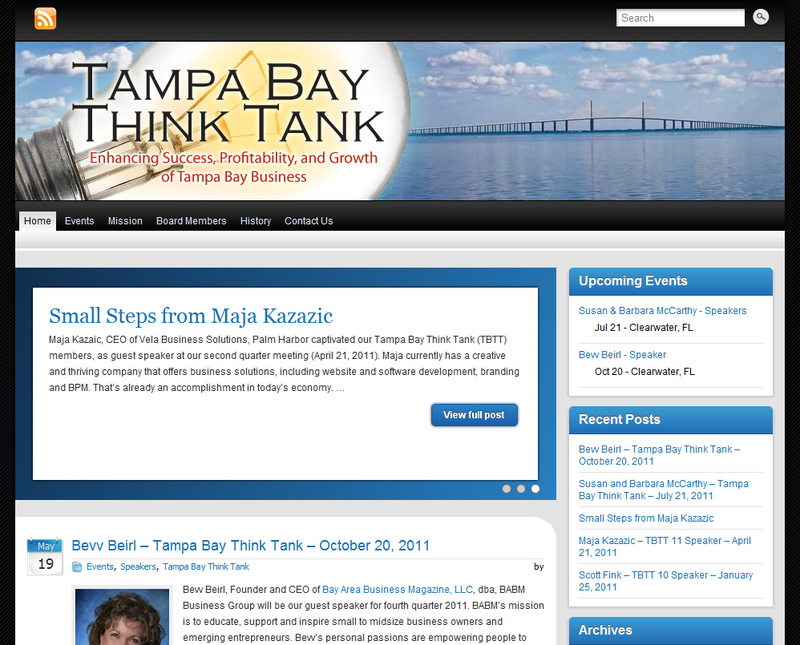 The Tampa header is visible in this screenshot. One of three random Tampa Bay images. This page of Board Members, shows an excerpt from each member's profile, in alpha order, with link to the full page. The Clearwater Beach header is visible in this screenshot. One of three random Tampa Bay images. This page shows an excerpt from one member's profile. The original website included PDFs only for each Board Member. I converted to individual web pages or a number of reasons: 1) The PDFs were not consistent, and were not possible to maintain without original files; 2) Individual pages allows me more freedom with photographs, original content, and links; 3) Content is king, and a page for each board member increases opportunity for the site to be found in search results; 4) The Board Members deserved more opportunity for recognition and business partnerships through their own pages. All blogs from the previous Wordpress.com site were exported and integrated into this self-hosted Wordpress website. I created two entries for upcoming speakers, and wrote a summary of the last event that I attended. I plan to continue to maintain these features, possibly including more entries about non-events. Someone will summarize each speaker's presentation for this blog - most-likely, I will write these for review by each speaker. 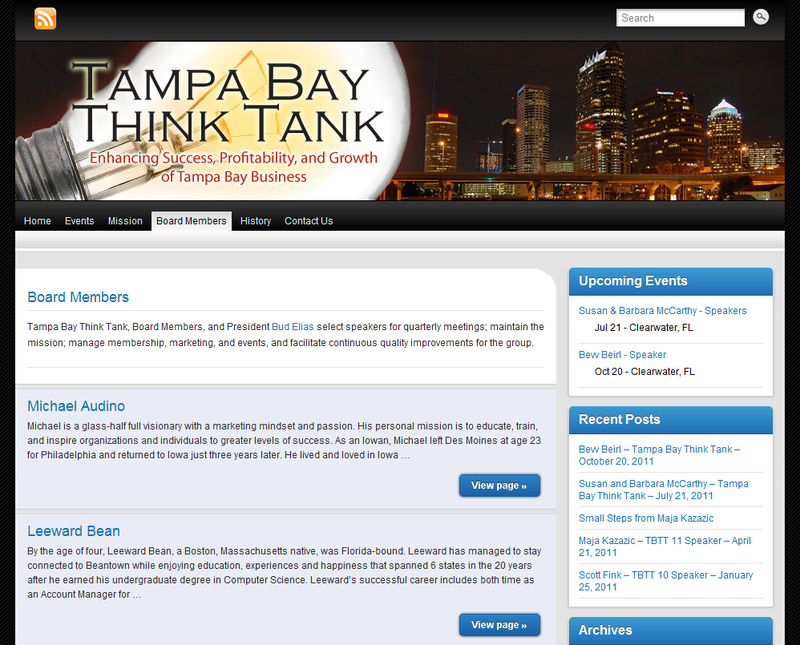 I used the Wordpress plug-in, "Events Manager Extended - Version 3.3.4" to integrate event creation, registration, and guest management right on the Tampa Bay Think Tank website. It's working exceptionally well, and even shows a list of guests (if desired) on the event page. 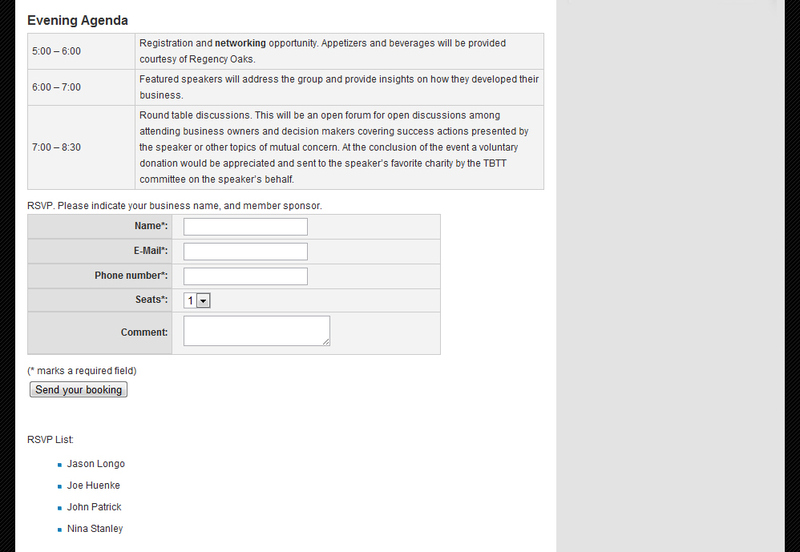 I feel this serves a number of purposes: 1) Confirm to the attendee that their registration was received; 2) Allow event managers easy access to information so that they can re-announce or manage facility needs; 3) Let potential registrants know that seats are filling-up and that their decision to attend is urgent. 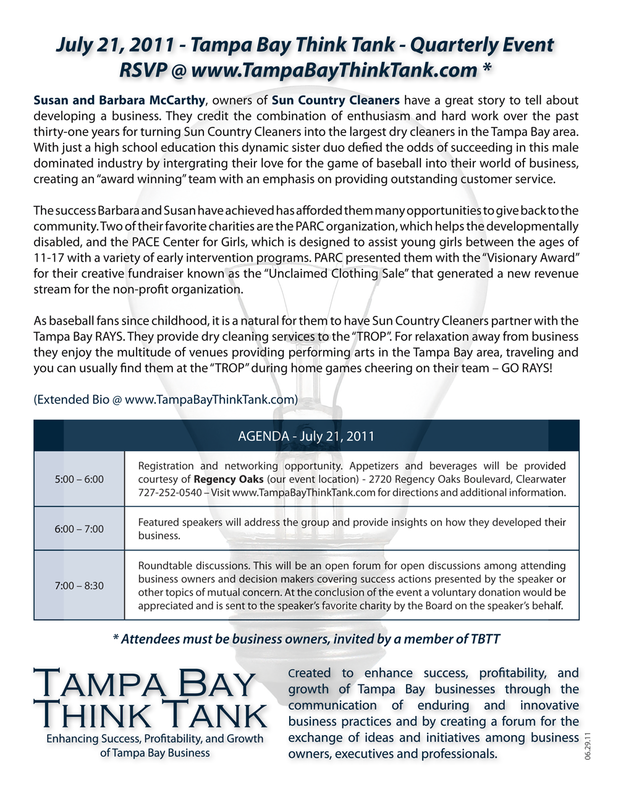 This was a flyer design that I created as a member of the Tampa Bay Think Tank. Elements were created with Adobe Photoshop, Illustrator, and the flyer was combined in InDesign. I will create new flyers for each quarterly event. Future flyers will include a speaker photo.